Info "Match the outlines to the monsters!" Shadow Shift is one of 9-Volt's microgames in WarioWare: D.I.Y. This game is based of the educational Wii and DS game, Big Brain Academy and even includes the game's title screen music. The purpose of the game is to match the silhouette of the monster with the picture of it. The monsters include a blue Frankenstein-like monster, a green goblin monster, a blue three-eyed ghost-like creature and a yellow dog-like monster. 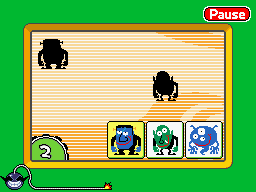 The monsters move around the screen and overlap each other. The player needs to tap the pictures of the two monsters whose silhouettes are shown. If the player manages to do this before time runs out, the game is won. However, if the player touches the wrong monster or time runs out, the game ends in a loss. This page was last edited on July 19, 2018, at 10:05.